My fears were confirmed today when the thermometer hit 82 degrees. Once again, Virginiahas gone straight from winter to summer. The forecast for this week has the highest temperature at 87 degrees and the lowest at 42. Good grief. I’m not complaining about this, though, just merely stating a fact. I think it would be pretty hypocritical to have complained about the cold and then switch to complaining about the heat now that it’s warm out. But seriously, some mild spring temperatures would have been nice. We went from 6 inches of snow on Thursday to 80 degrees on Tuesday. No wonder I got sick. Speaking of which, after feeling well enough on Saturday to run, I started feeling worse as the day went on. I’m thinking the only reason I felt better was by sheer will power… I really didn’t want to miss out on the race. Sunday I felt awful and pretty much didn’t do anything other than some cleaning around the house. Monday was another (unplanned) rest day, and a sick day from work. On the upside, my Dad is here visiting this week to help us finish putting new windows in the house (more on that in a second). We had the delicious cream cheese chicken chili for dinner. This was my Dad’s first time having it and he really liked it! Today I am feeling better in general, except for this cough that’s hanging around and keeping me (and Barry) up during the night, which is causing me to feel really tired during the day. But after work I just couldn’t pass up the nice weather, so Dad and I headed to the Dora Trail (the trail in town). I ran 3 miles just under a 10 minute pace and Dad biked 6 miles. Holy moly it is tough to run in 80 degrees after having colder weather!! I guess my cold had something to do with it as well….. maybe. So this window project. Back in November, my Dad and sister came to visit the week of Thanksgiving. Aside from spending time together as a family for Thanksgiving, the week also had a purpose. We spent it replacing the four front windows on the house. We moved into our house last May (first time homeowners.. woot woot! (yes I just said woot woot)). The folks who owned it before us were in the process of replacing the windows in the house, when they inherited another house and had to move. So out of the nine windows on the main level, only three had been done. 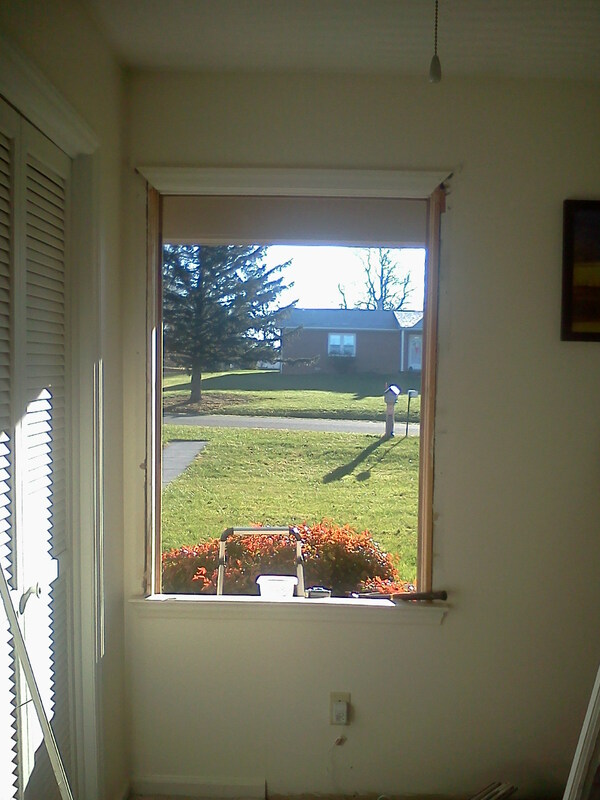 Dad helped us do the 4 front windows in November, with plans of coming back down this spring to do the last two. So that’s what he’s here to do, along with visiting for the week 🙂 I’m looking forward to more trips to the trail for him to bike and me to run, with this warmer weather! This has nothing to do with this post, but I came across this picture while I was looking for the picture of the window from November. Did you skip straight from winter to summer? Do you get 4 separate seasons where you live? We usually at least get summer, fall, and winter. What types of do-it-yourself home projects have you done in the past? 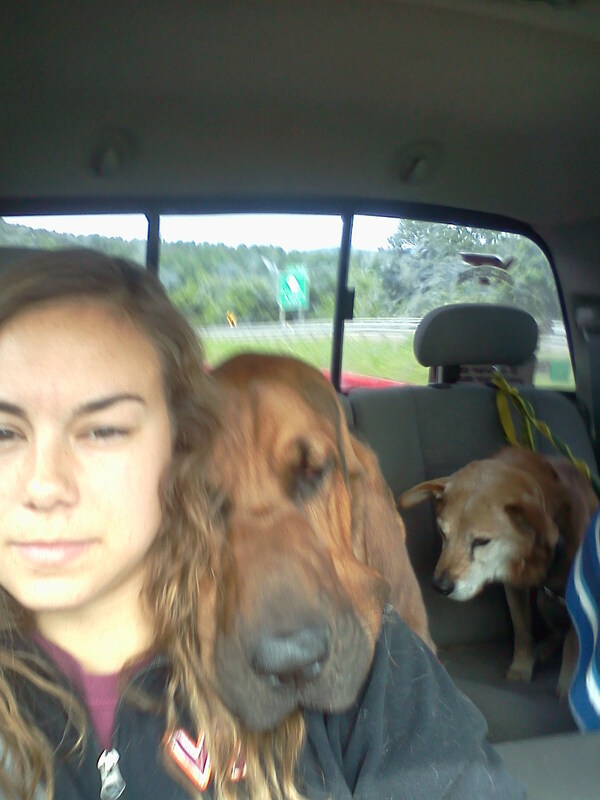 If you have pets, do they have a funny way of traveling when they’re in your vehicle? Ah that photo is adorable!! Hannnnkkkk!!! Indy is a strict head out the window kind of guy. Even in the middle of winter. I will complain about the weather for you. It is horrible. It takes me long enough to come to terms with summers in the East Coast when there is an appropriately long spring…but with no spring? uggghhhh. I was supposed to do a 6 mile tempo run today and I only made it 4 miles and then just sat on my porch dripping sweat for the next half hour. Oh no sorry about your tempo run! This heat always takes some getting used to ever time it comes back. Hank tries to put his head out the window, but all his skin flies everywhere. Hank is adorable. He just wants to be cloooose to you. Is he always a cuddler? We have done a lot of things on our own when we’ve owned houses (we’ve owned 4 ~ we’re renting now). We’ve painted, laid a pergo floor, dug out trees and changed the landscaping among other things! Yes 🙂 he’s 125 pounds of lap dog. But he’s so sweet. Y’all have done a lot if projects! When we moved here we painted and my husband installed a chain link fence in the backyard. I heard on the news today that we might hit a record high for today. It’s supposed to be 88 here. When I went out to run early this morning, I put my gloves on without thinking, and took them off the second I stepped outside. I’d forgotten just how much it had warmed up. I’m watching the weather like a hawk for Saturday’s race. Looks like it might be in the low 40’s at race time. See you there! I bet we hit that 88 today! It was so hot this afternoon. Haha yea Hank is so wrinkly. I think it actually hurts his eyes to have his skin blown back in the wind. Our seasons are “monsoon” and “less rainy”. Temps fluctuate by just a few degrees year-round. And I have never owned a house, so…not much do-it-yourselfing going on around here. Actually, I feel very little inclination to WANT to own a house. I love doing other things with my life/time, and puttering around fixing, repairing, maintaining, cleaning, and worrying about all those pesky little details makes me feel kinda exhausted. Or at least like I’d rather spend the time doing other things. I know, there’s a sense of accomplishment, and pride, and good mojo that comes from a do-it-yourself project; I guess I’m just not that into it…? I’m perfectly happy to accept whatever decent things are provided in/with my apartment, pay the rent, and call the management office when something breaks (which usually get fixed, with no effort from me, by the time I get home from work at night). That sounds like a lot of rain! I’m not a big fan of rain, especially the cold kind. I hate having to go out in it and I hate all of the mud. I hear you on renting. It’s definitely a lot easier to have someone else responsible for the upkeep and maintenance. I really like having our own place, though 🙂 Different strokes for different folks, I guess.